When no one answers the Resistance’s call for reinforcements on Crait in the final act of The Last Jedi, one can reach for a number of explanations: the chaos following the destruction of the New Republic government, individual systems’ lack of weaponry given the disarmament acts following the Battle of Jakku. One possible factor, however, plays into the heart of one of the sequel trilogy’s chief concerns, the idea of legacy. In the novel Bloodline by Claudia Grey, the truth of Darth Vader’s progeny is revealed, causing a massive scandal that forces Leia to leave the New Republic senate and tarnishes her name. That level of public disgrace could have easily endured the six years leading to the Battle of Crait, potential allies’ silence translating to a deep sense of distrust. 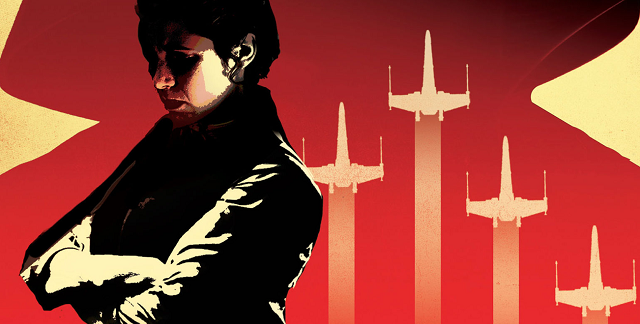 The weight of this scandal is something Leia must seemingly carry on her own—Luke’s place in the galaxy as a legend comes through unscathed, and again arises the idea of legacy. The starkly different effect this news has on Luke and Leia’s public standings is influenced by which institutional legacies they embody—the Jedi or the political—and reflects the splintered nature of Darth Vader’s identity over the course of his life. Luke Skywalker’s reputation precedes him by light years, tales of heroism during the Rebellion having solidified into legend and spread across the galaxy, from the destitute stable children in Canto Bight to the isolated planet Jakku. The inherent resilience of legends aside, Luke’s own is given an immense amount of power by the nature of the position he steps into over the course of the Empire’s fall: the galaxy’s only Jedi. “Jedi” is a loaded title, evoking not only the idea of a time before the Clone Wars and the rise of the Empire but also a potential return to it. Of course, that era was not without its problems, nor were the Jedi themselves, but nearly fifty years and countless Imperial-inflicted traumas lie between Order 66 and the parentage scandal. That is more than enough time and fodder to build the rose-colored glasses making the Old Republic out as an ideal, especially when the generation who actually lived through it has mostly passed. The gulf between reality and what was preserved in the collective memory is encapsulated in one of the many arguments Luke and Rey have on Ahch-To—to Rey, the Jedi are an all-powerful force for good that can only help the Resistance in the fight against the First Order, but Luke quickly reminds her how the Jedi played a hand in the Emperor’s rise to power. In fact, the Resistance placing all of their hopes on Luke’s return from exile is indicative of another element keeping his legendary status alive. Before Order 66, the Jedi Order numbered in the thousands, and as an institution it held considerable clout in the political framework of the Old Republic—the weight of all those expectations in the current era is concentrated in one man, turning a hero into a legend and even a messiah figure not unlike the “Chosen One” title hoisted upon Darth Vader while he was still Anakin Skywalker. In that case, the truth of his birth would not only do little to damage his larger-than-life position in the galaxy but could even bolster it further; the strength of Darth Vader may still exist among them, but it’s on their side now. It’s in the hands of the man who, as the legends say, saved them from Vader and the Empire. Leia is afforded next to none of these advantages when faced with the scandal. Her work with the Rebel Alliance, while crucial, was not comprised of momentous Death-Star-destroying or Emperor-defeating events that could spawn legends of their own; and while she is strong in the Force like her brother, she lacks the training and title of the Jedi and thus all the influence that comes with it. Without these to cushion her reputation, her relation to Darth Vader is filtered through her role as a New Republic politician—which is precisely why it does so much damage. At a surface level, being linked to Darth Vader in any capacity while the galaxy tries to move past the Imperial era is simply bad optics. How are the representatives of the New Republic supposed to put that behind them when the offspring of one of the Empire’s most dreaded figures is a sitting senator? Unfortunately for Leia, the issue is far deeper than that, tapping into the galaxy’s collective trauma and fear of history repeating itself. At the time of the parentage scandal, the partisan rift between Centrists and Populists over the strength of the New Republic central government has left the Senate effectively useless—stoking the memory of seceding systems from the Old Republic to the Separatists. In order to solve the gridlock, the idea of a First Senator is proposed, a position much like a Chancellor but more concerned with maintaining order. It’s a position that, until the scandal, Leia was nominated for among the Populist faction. Her peers in the Senate, though, undoubtedly recall how Palpatine seized power through his position as Chancellor, and giving similar power to the offspring of his right-hand man would not sit comfortably, even if that offspring is Leia Organa. With one public revelation, she goes from a well-respected politician and Rebel veteran to a source of fear, a potential shadow agent looking to continue the work of her birth father whom, until that moment, had been kept secret. Anakin Skywalker and Darth Vader are two discrete yet related identities contained within the span of one life—and it is no wonder the shadow that life casts refracts, one half falling on each of his offspring. Luke and Leia may not actively try to follow in Vader’s footsteps like Kylo Ren, but they cannot escape his influence either, a fact The Last Jedi weaves into the undercurrent of the film. Leia’s silhouette on the bridge of the Raddus holds the same shape as Vader in his cape and helmet, while the theme playing when Luke emerges to confront the First Order on Crait is a subtle twist on the Imperial March—they are their father’s children, with all the baggage, good and bad, that comes with it, no matter the secrecy around the truth of their bloodline. Vader’s is not a legacy that easily erased.